TheOneSpy understands that each one of you is different and has unique needs. You can tailor your software to your own needs by modifying your dashboard’s data upload settings with your own preferences. How Can a User Set Preferences? The user can easily visit TheOneSpy application settings through login and can modify every single available data settings in the following. 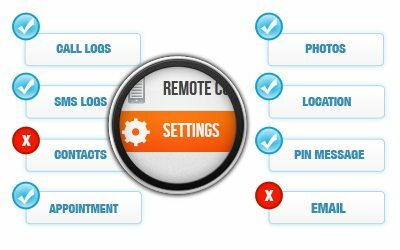 In sync settings, the user is enabled to set his/her preferences, either user can restrict/start any individual or all features log or a user can initiate any individual or all features log. The user has two options at the same time, either he/she can stop working application on the target device or he/she can start working application on the targeted device. The user can set preference within three-time intervals such as 5 minutes, 30min and 60mintues of location tracking feature of the TOS application. Within these intervals, the user can get the location logs information updated on its control panel. The user just needs to put his personal contact number within the application under the SIM Change Notification Number settings. If the target device changes the SIM Card then a hidden text message which contains the new sim number will automatically generate and sent to your given notify number. These settings allow the user to set the preference of TOS app works under the following conditions. The user can set the data-upload preference to work with WiFi internet connection, Mobile data connection, with both or, don’t sync option with anyone. The user has the privilege to restrict inappropriate incoming calls on its targeted device. He/ She can put maximum 5 numbers on the blacklist, and then these 5 restricted numbers will not be able to make calls on your target device. If a user wants to block all internet activities when its target is driving behind the wheels, he/she can block all the internet activities on the target device remotely. The user has the power to block all sent or received SMS on its target device remotely when the target is driving behind the wheels. The user can also restart the targeted device along with the remotely, through its control panel. Remotely reboot your target device. In-case, TheOneSpy application is not working properly or it may crash by default, then the user can easily restart the application on the target device remotely. The user has the power to delete the TOS application at any time from the target device remotely. Delete TheOneSpy App from your target device remotely. The user doesn’t have to contact the customer service representative if he/she wants to change the target device (Device Switch) for monitoring purpose; a user just has to install the TheOneSpy application on its new target device. If a user wants to switch platform or operating systems such as iOS and android then he/she has to contact TOS customer service representative to gets a new license in order to monitor the target device running with the different operating system. Want to spy on someone’s calls but don’t want to check out their calendar? Want to read their texts, but don’t want to look into their browser usage? You can do whatever you like with your own TheOneSpy App. You can switch on any feature you wish to use, and switch off whichever you don’t want, in order to control the data inflow into your dashboard – the web portal where all of your target phone’s data is saved. Remember, we at TOS cater to each and every one of our customers in the best and most personalized way possible.